The building of the super J-class "Rainbow"
The J-Class Rainbow, designed by Dykstra & Partners for a repeat client, has started building at Bloemsma Aluminiumbouw. When the hull will be ready, Rainbow will be transported to be finished at Holland Jachtbouw (HJB). The re-build of this originally William Starling Burgess Designed yacht will be under supervision of Dykstra & Partners Naval Architects. Rainbow will be built and fitted out to race with the existing and new J’s according to the JCA (J Class Association) rules. To keep the J-Class fleet and races alive and to encourage new build yachts to enter the field, new JCA maximum performance rules have been developed, including allowing aluminum as building material. The new rule is a VPP (Velocity Prediction Program) based rating system which puts limits to the performance. This new rule has been developed by the Dykstra & Partners office and the Wolfson Unit in Southampton. 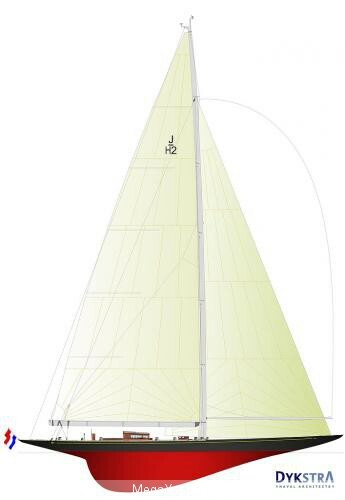 The aim of the JCA, the Dykstra team and the rule is to bring fair & close racing to the fleet and to give all designs a chance of winning (on a handicap based system). Over the years the Dykstra team gained an enormous amount of hands-on information by racing on all the J’s in the current fleet. Dykstra & Partners have gained over 20 years of J-Class experience and where responsible for the rebuilds of the J-Class yachts: Shamrock V, Velsheda, Endeavour, refit of Ranger and the new build Hanuman (Endeavour II project). Rainbow will be the 2nd new J-Class in order for the Dykstra team. More new J-Class projects in design for clients and refits under supervision of Dykstra & Partners for current J-Class yachts are planned to take place in the coming year. On Friday 22nd January, before a large crowd, the keel was laid for Rainbow. The original Rainbow, commissioned by Harold Vanderbilt, was built in 1934 to defend the America’s Cup against Endeavour. Rainbow’s defense was successful, but Rainbow was sold for scrap in 1940. Gerard Dykstra & Partners have been asked to redesign this Dutch flagged J-class boat, based on the original drawings. to the original plans a Boxboom will be used instead of the “Park Avenue” boom and the design of the rigging will be original too. But the 40 meter yacht will now have an aluminium hull and full carbon mast and rigging. Rainbow will be fitted with a diesel-electric propulsion system. Two generators deliver 350Kw shaft horsepower. The propeller, which has hydraulically adjustable pitch, will be used to charge the batteries on Atlantic crossings. This hybrid engine is smaller and lighter than other engines. This feature makes Rainbow quite unique. The hull is constructed by Freddie Bloemsma Aluminiumbouw in Makkum, the Netherlands. In spring 2010 the boat will be transported over water to Holland Jachtbouw in Zaandam where she will be finished. By the end of 2011 she will be launched and extensive tests and trainings will commence. The first J-class event in which Rainbow will compete will be in July 2012 in Cowes. Rainbow will be fitted out for racing but she can also be chartered for pleasure trips or business incentives. A permanent crew of seven will look after a maximum of eight guests. The sailing yacht Yankee and SY Rainbow will be fitted with a unique WhisperPower Hybrid propulsion system allowing them to navigate at up to 5 knots and manoeuvre entirely without emissions using 2 x 288 VDC/160Ah Lithium Ion batteries (LiFeYP04). 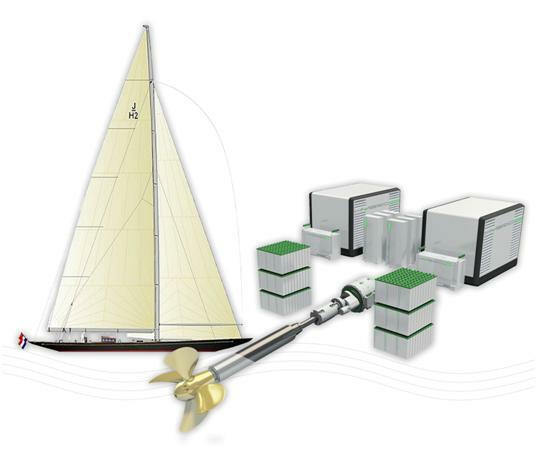 During sailing no generators are needed to control the sails as all hydraulics are powered by the same battery banks. Most of the time the on board 230/400 VAC consumers, including the air conditioning, will operate through a 35 kVA inverter via the batteries. A 50 kVA variable speed generator from WhisperPower will be installed to recharge the batteries and provide electrical power to the various loads. An auxiliary diesel engine of 294 kW is planned with a 50 kW flywheel-integrated electrical motor for electric propulsion and will double as a shaft generator when the yacht is under way, generating a maximum power of 10 kW. The systems are designed in close collaboration with Holland Jachtbouw and leading technical companies in the Netherlands.